Ready for a heavy load of groove metal? One year after their forming in 2008, Arisen From Nothing already released their debut EP. Their debut full-length, called Prototype came out in 2010. Prototype was followed by In Nothing We Trust, released in 2012. Since September, this Seattle based metalband has released some new material, an EP called Broken. Arisen From Nothing’s lineup is guitar-combo Troy Elmore/Steven Pontius, bassist Eric Hanson, drummer Brandon Fuller and vocalist Jessie Brigham, with Brandon and Jessie being the newest Arisen From Nothing members. With Broken, Arisen From Nothing gives us five new tracks with an total length of 20 minutes. So, this will be a very short release. Do we think that’s a problem, or not? Let’s find out! The quiet intro of opener Chaos sounds far from chaos, but when the guitar kicks in for the first time it is clear that this is some very energetic music. It won’t be chaos nor as quiet as the intro suggests. The tight guitar riffs combined with the pounding drums give us heavy, grooving metal. In addition to the tight guitarwork, there is also room for some deviant guitarrifs or a solo, for example in American Patriot. The heavy vocals of vocalist Jessie Brigham sounds perfect combined with this energetic, powerful music. His vocals vary from clean to a bit rawer, with the power and the passion being in his voice in both situations. With Born Hated, the last track on this EP, Arisen From Nothing go fully insane one last time. All energy that was left (even more!) is thrown in this track. That’s why Born Hated is the heaviest track on Broken and it’s a perfect closing track. What stands out on Broken is the variation between very heavy parts and more melodic parts, vocal-wise as well as instrumental-wise. This is what makes Broken a very strong release and what will keep your attention at Broken. 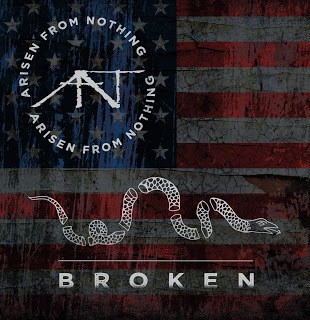 With Broken, Arisen From Nothing released a very heavy, nice EP. To get back on Broken being 20 minutes and whether it’s a problem or not: I clearly say yes, it would be nice if Broken had a longer length. Highly recommended for sure!